Report – Scuderia Ferrari drivers, Fernando Alonso and Kimi Raikkonen finished the Brazilian Grand Prix in sixth and seventh places respectively, after staging a great duel, which saw them swap positions with only a few laps to go. Everything went smoothly for Fernando at the start, as he maintained eighth place, while Kimi emerged from the Senna Esses in 12th place. The first pit stop came very early, as the Soft tyres degraded very quickly, after track temperature had exceeded 50 degrees. All the drivers tackled the second stint on the Medium tyres, which were clearly more consistent, to the extent that Fernando and Kimi extended the stint, making up places before their second stops. Kimi had a really strong race pace at this point, which, while the pit stops were on, saw him run as high as third. Alonso – Zero frustration over Raikkonen battle:When asked post-race if Raikkonen’s defending prevented him from finishing higher than sixth, Alonso said: “No, I’m very very happy – zero frustration.”The most important thing was not the battle with him, it was the battle with the other teams and we got some good points for Ferrari today. 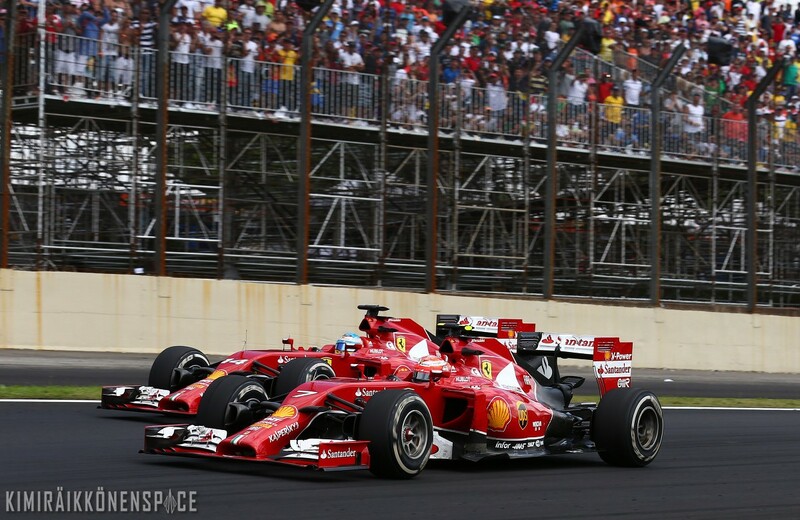 Alonso said that he was pleased to come out on top in the battle with Raikkonen. “Finishing in front of him always gives satisfaction,” he added. “This weekend I managed to finish in front in qualifying and in the race after a weekend where I struggled a bit with some mechanical issues. “It was definitely a good experience – I had one more stop so I had to recover 21 seconds. Raikkonen described the dice as “normal racing” and said that he did not feel the battle had cost Ferrari anything overall. Great to see the real Kimi. It will only be bettter. Thanks Kimi! It was brilliant……our own the best Kimi!! Ferrari – why it took so long to find out, what your best driver needs? So shame……. Kimi, go on , You´re the best! Great to see Kimi finally showing everyone that he can be right there with Alonso if he had the car to his liking. Too bad it took Ferrari this long to get it sorted. Totally agree – I never thought for one minute that Kimi had forgotten how to drive over the winter break !! Also good to see the comments from other drivers (Jenson Button & Seb Vettel) – they know they can trust Kimi implicitly to race hard but fair. Great compliment to his skill, honesty and talent.